All operator cycle designations are reduced to 24 volt AC operation. Normal electrical functions are operated at 110 volt AC. The 24 volt AC operation reduces operator exposure to electrical power. Most control components shall be "plug-in" style which enhances service if it should be required. Sterilize (Cycle) and Dry Timers shall be automatic reset type which allows the operator to visibly acknowledge the preset time as well as the elapsed time. A main wiring terminal strip allows easy checking of electrical components if required. All electrical connectors and wiring shall be numbered and color coded for ease of service. Cycle sequence shall be easily monitored through the use of rectangular indicator lamps showing each phase of cycle operation. A "DOOR LOCKED" light shall illuminate when the chamber door is properly closed. **A "LOW STEAM PRESSURE" light will illuminate and the cycle cannot be initiated if a low steam pressure situation exists. All operation functions shall be initiated through the use of various solenoid valves which shall fully control the cycle of the sterilizer. Cycle selections shall be designated by the operator by a single press of a button, and the cycle selector shall illuminate to allow other personnel to realize a cycle has been selected and started. If electrical AC power is unavailable, steam will not enter the chamber. If electrical power is interrupted, the autoclave shall automatically vent all pressure from the chamber, allowing the chamber door to be opened. Simultaneously, the unit shall reset all cycle functions. When power is restored, the cycle selection must again be designated by the operator. The entire electrical circuit shall be protected by a manual reset type circuit breaker, rated for the maximum acceptable amperage for the electrical components used. All electrical components shall be Underwriters Laboratories approved and/or listed, as necessary. Temperature control and documentation shall be assured with the use of a United Electric Model 650, 61' inkless recorder, mounted in its own cabinet box and secured to the control panel. All piping shall be rigid brass with threaded connections, with the exception of pressure sensing piping, which shall be 1/4 " O.D. copper with flair or compression connections. All solenoid operated valves shall be of one manufacturer, and rated for a minimum of 50 psi operation. All plumbing components shall be installed with brass union connectors to allow ease of service or replacement, if required. All manual supply valves shall be "ball" type, actuated with a manual handle. Pressure gauges for supply steam pressure, jacket pressure, and chamber pressure shall be mounted in such a way that the operator can easily monitor variations. The vessel shall be protected against high pressure with the use of a safety valve rated at the maximum operating pressure of the vessel as stated by the original manufacturer, and shall not exceed A.S.M.E. standards. The existing vessel shall be hydrostatically tested at 1.5 times its rated working pressure to assure long life of the vessel. The interior shall be cleaned with the use of a fine glass bead, applied under pressure, to remove existing discoloration normally found on the inside chamber walls. The exterior shell shall be painted with high heat temperature, rust retardant paint. The exterior shell shall then be covered with 2' thick, foil backed insulation to reduce ambient heat normally released from the vessel. The door for the vessel shall be refinished and/or rebuilt, as needed. The main control panel shall be fabricated with .125" thick aluminum. All designation lettering shall be engraved into the panel and paint filled, for long life and durability. The control panel shall be mounted to a fabricated stainless steel primary frame on top of chamber, and shall tilt down at the operator for ease of visual operation and a pleasant cosmetic appearance. The main control panel shall be hinged for easy access for maintenance and calibration purposes. All stainless steel and painted surfaces shall be refinished as needed for a "like new" appearance (not applicable to NEW sterilizers). Complete calibration and testing shall be performed prior to shipment. 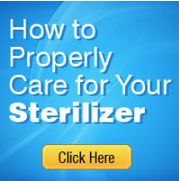 Upon completion of installation, Alfa shall provide complete orientation and demonstration of the sterilizer. Installation is included only when so quoted. Any structural or cosmetic repairs to existing walls, floors, ceilings, etc. shall be the responsibility of the customer. Please note this is a condensed version of what is needed for proper operation. 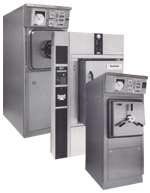 Complete installation and user instructions will be provided with the autoclave. It is further recommended that you contact the factory for a list of authorized service representatives in your area. E. Safety valves to be piped 5" above the floor. Check with local codes. D. Vacuum Pump, disconnect by unit, specify voltage, phase and amps. Follow all local codes. Note: The above information should be used as a reference only. Your facility may have specific requirements. In addition, the factory and an authorized service representative should be contacted for special needs (i.e. bio-seal, double door, stacked unite, etc.). The device used to maintain a tempreture no greater than 140F at the house supplied floor drain is not electrically controlled. The drain tempreture is controlled mechanically, thus preventing tempretures from rising too high even in blackout conditions.